Total rip off! Does not work with new iPhones! Refund my money! Why is this App still available when the company is not in business and it DOES NOT WORK WITH PHONES NEWER THAN 2015. Does not work with new iPhones! This app is HORRIBLE, unable to share!!!! I had this app on an iPhone 6, and it suited my purposes nicely. I just got issued a new work phone (iPhone X), and now the app doesn’t work quite right. Even with syncing to iTunes to download the voice files, it is very difficult to access them in chronological order (which was easy in the app on iPhone 6). I downloaded their desktop app to try to bridge to ITunes, but it didn’t work well either. I tried to contact the developer through their website, and the App Store, but get a 413 error. I suggest finding something else until the dev gets the many bugs fixed. I liked the app when it worked! Right in the middle of recording it just stopped. I lost valuable data. The app’s support portal is not functioning. I had a playback error and am looking to see if I can recover information. The app has been reliable since I started using it years ago. I’m a reporter. But when it failed, there seems to be a communication blockage. For some reason all my recordings are now sorted out of order. I’ve used this for a couple years and loved it. But now the recordings start playback in the middle and won’t even playback to the end. So they’re all only partial of what was recorded. Needs a bug fix and upgrade. Doesn’t work. I can’t figure it out. I’ve looked all over the app I paid for and still there’s nothing it tells me to transcribe. Waste of money. Paid $2.99 and it is worthless. Converting voice to text via email...email never arrives. Go to settings and help and it says the domain is for sale. Go to tech support and send message and it says 403 forbidden. Sounds like these pirates are out of business but still taking coin of the realm. Has this app been abandoned by the developer? Last update looks like it was 2 years ago. I’ve been using this app for years, and previously I would’ve given it a great review. But lately, the titles of recordings won’t sort in any particular order, by title or by date of recording. Very frustrating. Please fix. I purchased the pro-version, but am not seeing any options for converting from voice2text. The nfinity website isn’t functional and there are no FAQs for resolving this issue. It’s a waste of money. I have a court order to record my skype sessions. This program constantly quits working during skype without notice causing me to loose extremely valuable evidence. It quits more often than it works. It does this on both my iPhone 6s and iPad Mini. I’ve tried a bunch of recording apps and this is my favorite. I started out with the free app and liked it, so I sprung for the paid app — to get the file sharing options and voice-to-text emailing — and am glad I did. Pls don’t change a thing. Keep it simple. Thanks! Note: Noticed some reviewers having trouble getting recordings off their devices… Use the File Sharing function. It couldn’t be easier. Look it up on Apple’s site (or the “i” button, for Info, on the app). Hope this helps! This app is great but it's really annoying how you can't accurately scan through the recording. It's always jumping through huge sections (backwards and forwards) and you can't scan to the last place you stopped at. Please fix this!! I bought this app some time ago to record meetings but over times I am seeing an error message to the effect that recording has stopped. This error has become more frequent over time. I can generally start recording again if my iPad is in locked status there is nothing to indicate recording has stopped. I have tried to contact the vendor but as the contact form is broken (it branches to a domain that is for sale when you click submit) and the emails sent to addresses I have for them do not work. I am using an iPad mini 2 (model ME279LLA) running the current version of iOS (9.3.5) and there is about 3GB of free space on the iPad. I am really hoping someone from the company will see this review and at least fix the contact form but until they do, I cannot in good concience recommend this app to anyone as there is not an indication that it has failed if the device is in lock state and critical data may have been lost before people realize it is not recording. I feel somewhat guilty about posting this review as I got several years of use from the app before this started happening. Since purchasing the app for the $2.99 price, it keeps crashing. I uninstalled it and installed it again and it's be same thing - crashing. It doesn't work. I have yet to get an email. 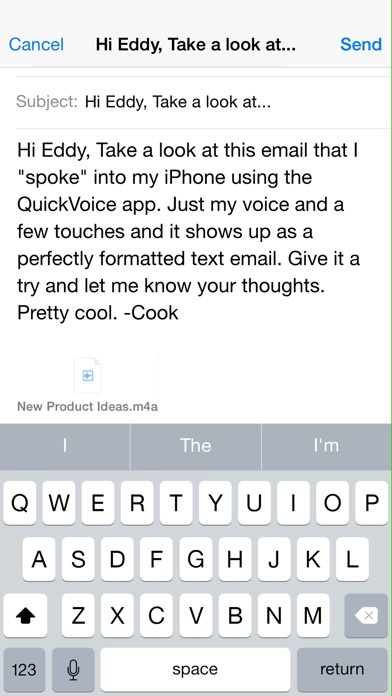 In QuickVoice I record a few seconds of voice, touch on “Voice to Text Email”, fill in the address field for the email, and touch “Done”. About twenty seconds later the message “Success – Audio sent for conversion” appears. I touch OK, and nothing more happens. No email is ever sent. The process has ended. I am running Microsoft 10 OS. Is that why? I got this app to try and email a recording from quick voice. It doesn't bring the recording over from the standard addition. It does not work. Buy the .99 cent option in quick voice. That will give you the option to email your document. Its "award winning" desktop interface is the worst thing I've tried to use since the MS-DOS years. The app records fine. Such a little app.. yet to the point. Saves me time by allowing me to speak my thoughts . I was delightfully surprised at the accuracy and relative smoothness of the speech-to-text. This is just the kind of app I've been wishing for! I don't think there's anyone to support this app anymore. They used to be responsive and good, now nobody replies when there's a problem. This app has a major glitch: Sometimes when you hit the record button, an error message comes up that says "recording error - an unknown recording error has occurred". It makes the app quite unusable. 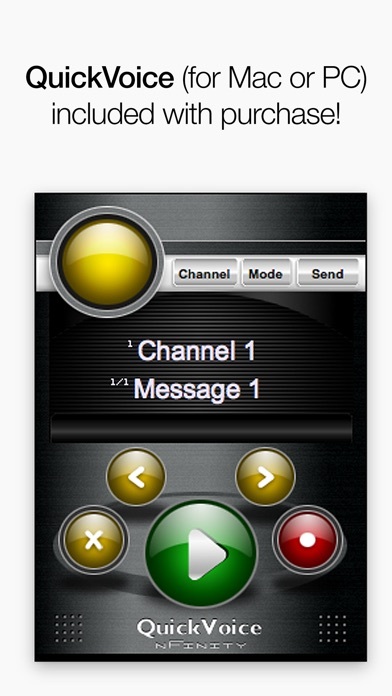 It's too bad, it used to be the best voice recording app out there. THIS APP WILL NOT TRANSLATE SPEECH TO TEXT. I WAS TAKEN BY THIS FRAUD! I needed this to record a Skype interview and have it transcribed. I searched online for iPhone apps that would record Skype calls and this one was top. I paid for the pro version and nothing. I tried recording in the background while having snapchat open and it interrupted as well. Not worth it if you want to record while still using your phone normally. I thought, as it says, that you can "upgrade" to pro and your files would be shareable...they are still not. It didn't upgrade my voice memo app, it installed a whole new one. So I still can't share my files. Support people please contact me there is no link to send you an email or get in touch with you. The app stupidly still doesn't permit editing of recording titles without having to completely erase the text. App will not let you mail files that are too large, but it won't tell you they are too large until after you stop recording. Will also not allow you to transfer the file via iTunes either. So you can't edit the file in any way. It's trapped in the app. It also claims you can adjust quality but there's no button or icon for how to do this. This app is very helpful for my phone. It helped me translate the voice into text. It helps me save time. Good app. Firts, i must say this app is very good, i using several record app, this (app) is very simple, easy to use, high record quality, nice user interface, highly recommend!! It picks up my voice and records what I say. It then transcribes it and I can keep the voice notes. It is easy to set up. It runs well. It captures what I'm saying and plays it back clearly. I like using it to organize my thoughts or reminders or texts I want to send. 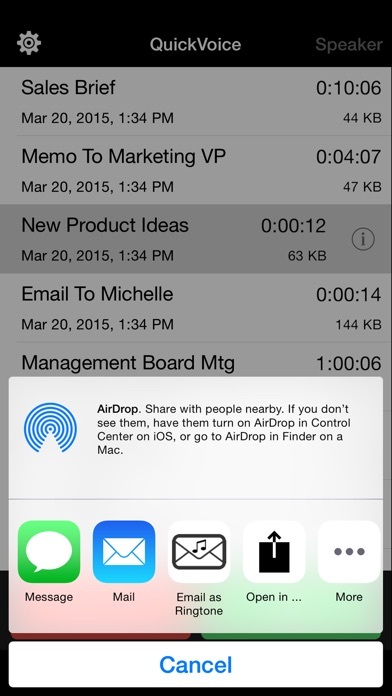 Great app to records meeting and share it to everyone via quickly. Faster and safety. Great! 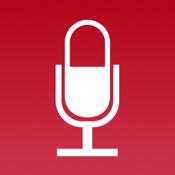 I use this app numerous tines each week to record audio files lessons for students of mine. It is simple to use, has a nice file system allowing the user to create a file directory and records in acceptable quality for my purposes. Highly recommended! It also has beat sharing functions to send via email which is perfect for my use. Love ❤️ it. This is an app that I'm finding. It is very good. Friendly interface. Designing quality, user can use it easy. Thank you so much. I've only had this app 3 days and it will not play back the recordings . How do I get my money back? I just purchased this product for my iPhone version 5.S, iOS version 10.3.2 with plenty of memory available. The product works standalone however, when I tried to record during the phone conversation I get a message saying "an unknown Recording error has occurred" How do I how do I resolve this or get my money back? This's really favorite application in my iPhone. 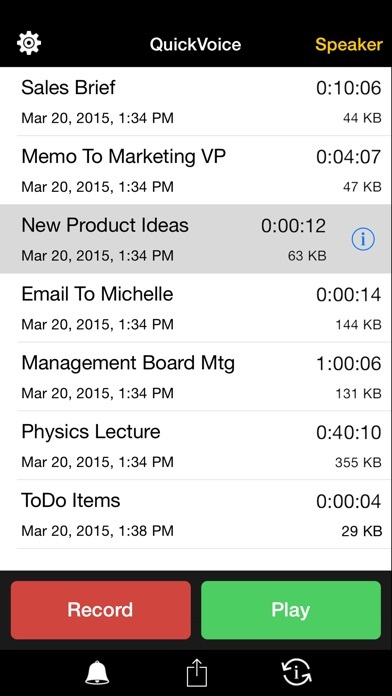 I can use it to record meetings in my company and share it to everyone by email. Beware the voice to text feature is only for 30 second recordings. Most of the time, it fails. I upgraded to Pro but doesn't transcribe. I contacted support over a week ago and haven't heard a word. So, until this thing works its total junk. Don't waste your money. If I hear backend the issue is fixed I'll change my review. I bought the pro version because of the speech2text option. However, I haven't been able to do it. The tutorials on the web show an screen from an older version. I have been waiting from an answer and still waiting. Can someone help me and show me how it works? Thanks I get a screen "audio sent for conversion" Where? This was an awesome app, but the company seems to be out of business and no support available. Still works with 10.3.1 however. Any mention of addition apps for pc use are inaccurate. My rating is because the app still works great but there's no More support for it. And it has been frozen ever since. Can't delete or re-install. Waste of my money. When you upgrade to Pro there is no way to port over all of your old recordings. Terrible recording tool. Very frustrating. Lousy App, lost all my recordings.Dont waste your money.Not even worth the one star!! Highly disappointed. This is great! It’s so simple and easy to use. I have it installed on both my iPhone and iPad, so if I want to record a phone call, I just put the phone on speaker and record on the iPad. I have recorded entire proceedings on it, thereby saving the cost and wait for a written transcription. And it’s so much better hearing the actual testimony than just reading it. The voice quality is great. And I’m only using the medium setting. It’s so handy to have. My friend uses it to record her mother’s doctor visits so she can be sure about what was said. There are so many uses for it. And it’s so easy to just text or email the file right from the app. I, too, used to love this app but on iPhone X whatever you record goes in to outer space. I have to go through all my recordings to find my latest one. There is no logical sorting. I do hope this is fixed very quickly before I have to find something else. I have been using QuickVoice for years but this has become ridiculous. PLEASE FIX THIS BUG! The basic app prompts you to upgrade to the pro so you can transfer your recordings. Upon upgrading to the pro version, you will discover this is a new app and the original recordings are stuck in the basic app. Waste of time and money. 1000s of other recoding apps out there that can transcribe and these people TRICK you into paying them only for it NOT to do what you were asking it to do when it prompted your to upgrade. Waste! Do not buy!